Getting the consistency, tone and overall achievement of an anthology right is tricky: if it is a poetry anthology, your likely audience is a finicky one (people who appreciate poetry and are prepared to pay for it, as well as other poets) and will have a long line of other volumes in mind when they sit down to read. If a fiction anthology, the audience is more likely to engage on the basis of an established theme or genre (think ghost stories, crime writing, science fiction) and bring along a host of ingrained expectations which have to be met. And if the book is a themed poetry anthology – and moreover one like Fifty Ways to Fly, sold in aid of a voluntary body supporting a good cause, in this case the British Women Pilots’ Association – the task and audience become harder still. Now the person picking up the book must like poetry, be willing to pay for it, have come with a pre-existing interest in the subject matter and knowing the purchase will assist a voluntary body, finish the book with their appreciation and understanding shored up (preferably then heading on to the charity’s website to find out more). It is a huge ask of any editor. Alison Hill has done well to meet all of these expectations. 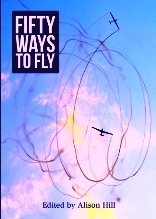 Fifty Ways to Fly isn’t perfect – the inclusion of song lyrics, and work by people more associated with the heroic historical achievements of some of the poems than with poetry itself, means the quality is necessarily uneven – but achieves something across each of these three demands. There is poetry here, with some being of the highest quality; there is subtle extension of the idea of flight into new conceptual realms, as well as a wealth of work exploring the direct experience of flight; and there are moments of real tenderness in lives spent among the clouds. or weather on the way? until I land some day? when I take off from here. Butterflies fly towards the clouds. narco fiestas, with bullets in their skulls. The book has its points of failure, too: Lynn Woollacott’s interesting concrete poem ‘Icelandic V’ presents two diverging paths of geese, first to reflection in church windows and then the water of an estuary, at the two opposing points of a ‘V’ which spreads across both pages; a nice conceit, but one which doesn’t quite hold up when the words are extracted from the form and left to stand on their own. Similarly (and unfortunately), the title piece by Maggie Sawkins is a rather bland list poem. ‘Fifty Ways to Fly’ does not rise very much above its opening line “1. Launch yourself from Ben Nevis” and for it to occupy such a prominent place in the book is disappointing.